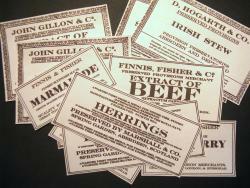 Crimean War period type preserved provisions labels by Hogarth of Aberdeen & Deptford, Gillon of Leith, Marshall of Aberdeen, Finnis, Fisher of London & Bussorah (Basra). 10 Labels. Fix to large plain tins, eg, Lyles.